As we settle into winter, there is a delicious chill to the air, and things changing with the seasons. Chickens stop laying eggs and Angie has decided to moult all her wing feathers, she is a scruffy looking girl at the moment. Bridget has decided to keep all her plumage, very wise I think. 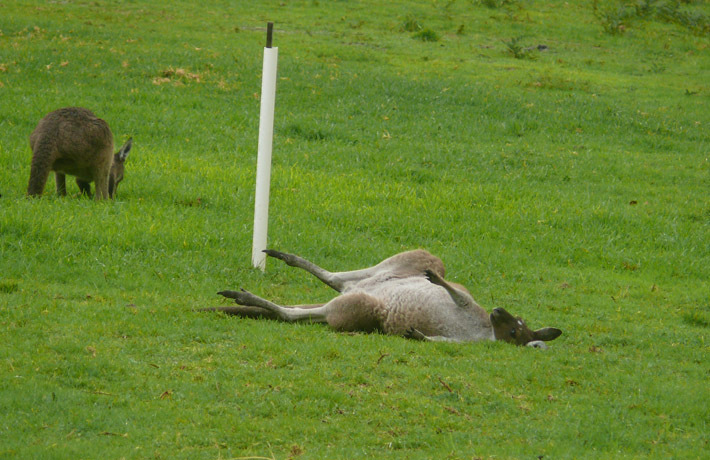 Kangaroos take every opportunity to bask in the afternoon warmth. This one took it to the extreme, lying on his back for ages, working on his tummy tan. 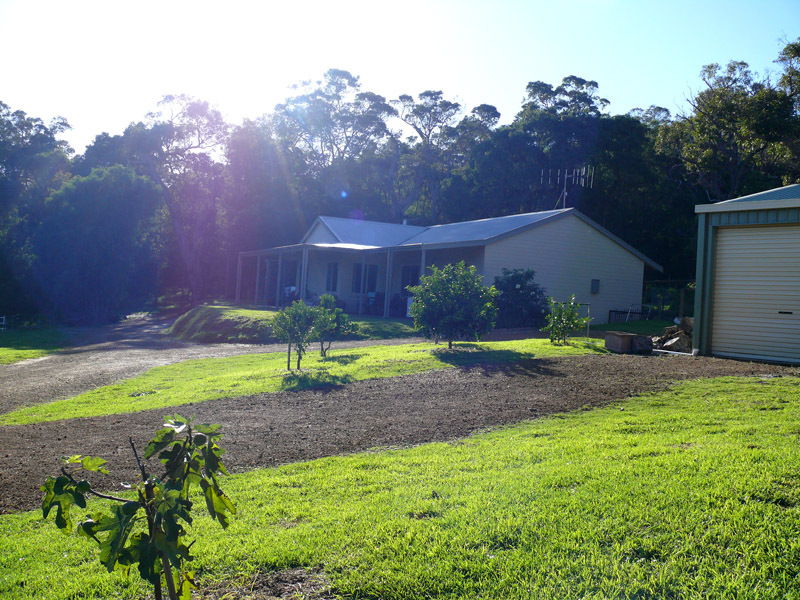 We are loving the greenness that is enveloping us. 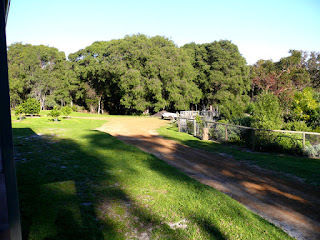 We've nearly got full grass cover right in front of the house now, just a wee bit of sand showing through. There is a surprising amount of colour around too, considering how cold it is. 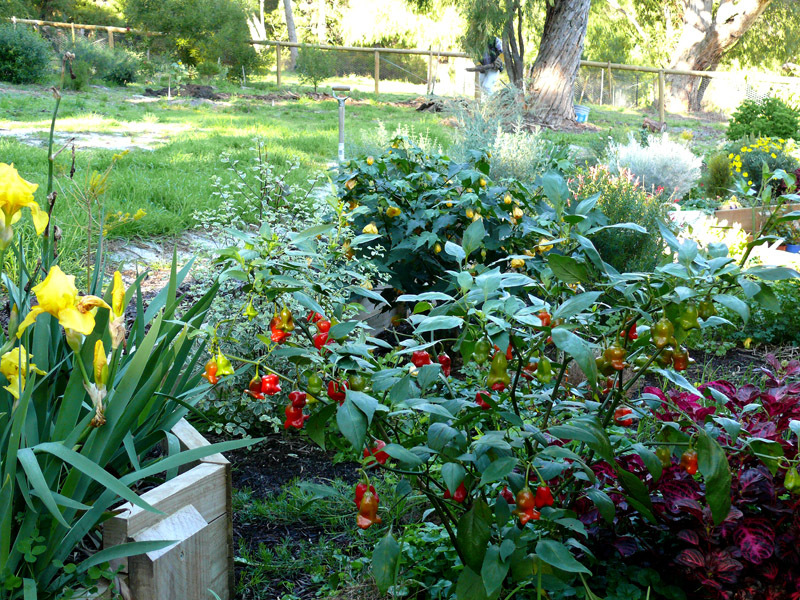 The bell chillies are hanging their with their shiny redness, the yellow bearded iris are shooting up their tall towers of blooms, the yellow abutilon just keeps on keeping on, I've never seen it without flowers and it is particularly abundant at the moment. The wattles are starting to flower. 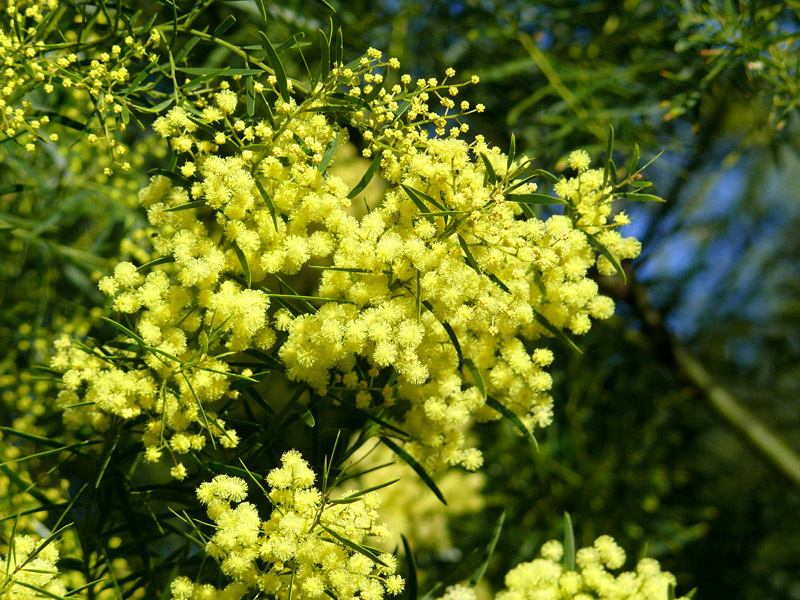 This one is my favourite, a small weeping tree called Acacia fimbriata. Apart from loads of flowers, they have a wonderful fresh and slightly fragrant scent. 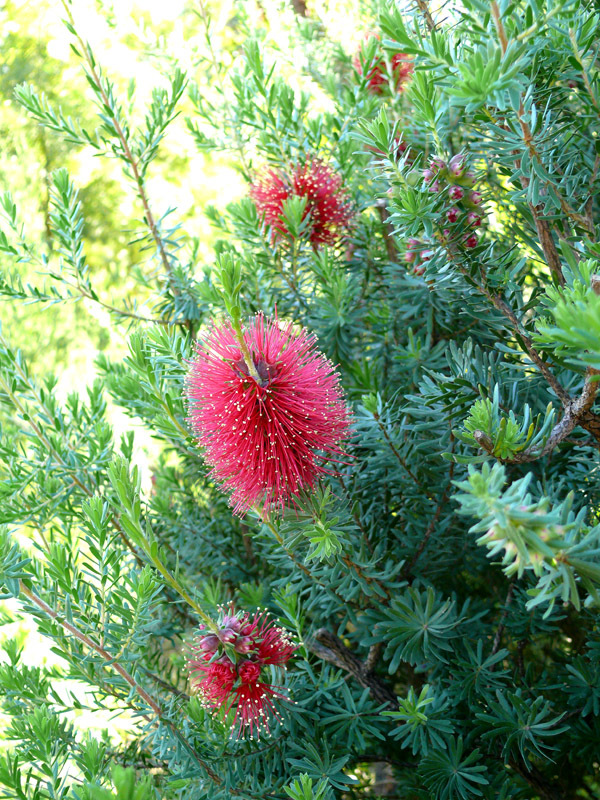 The kunzea is just starting to flower, the little birds love this big shrub, it's very dense and good for hiding. 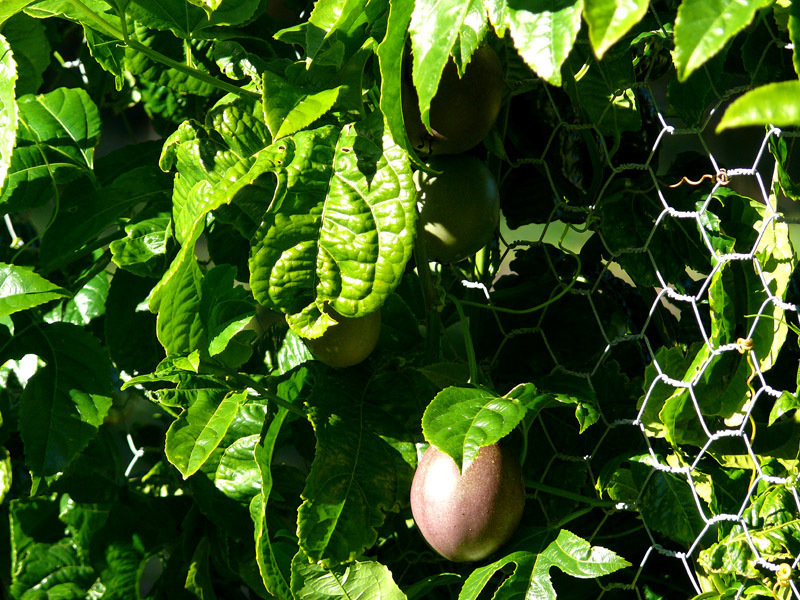 The passionfruit vines just keep on keeping on. I expected dormancy and bare branches by now, but they are still full of leaves and fruit. 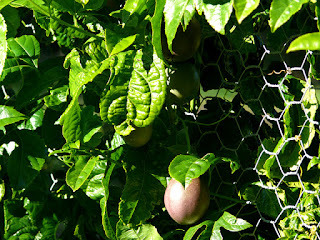 A few fruit are trying to colour up bit, we tried one the other day, lovely passionfruit flavour but rather sour. Not surprising I suppose, I imagine warmth and sunshine gives fruit its sweetness. 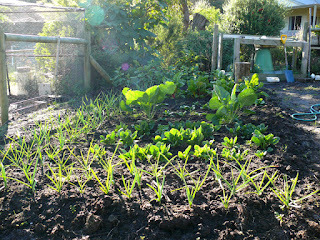 Steve has been a busy lad with the planting of the winter vegies. Everything is growing well. 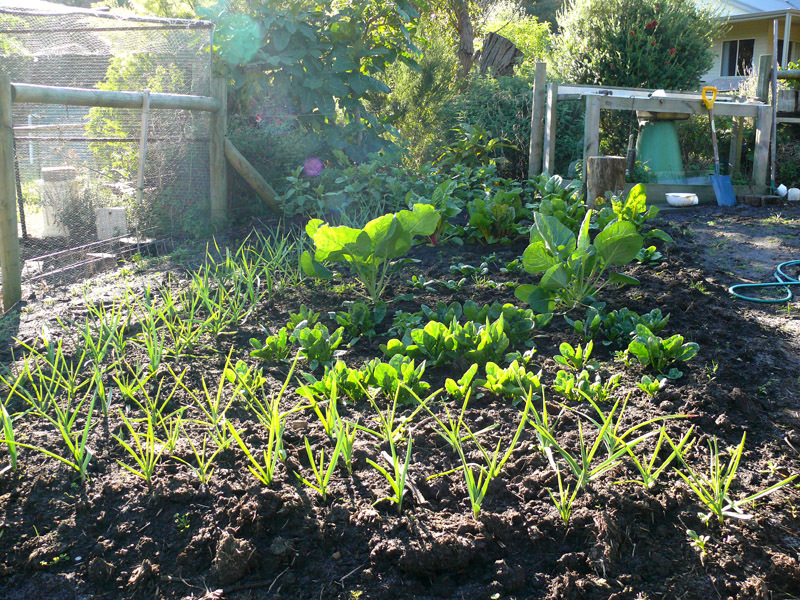 This bed has celery around the edge, with beetroot, broccolini and cabbages in the middle, with potatoes at the end. Steve has another potato bed that he planted back in March, we are enjoying yummy King Edwards and Dutch Creams from there now. Potatoes grow well here, we seem to be able to keep ourselves self sufficient in those, which is great. 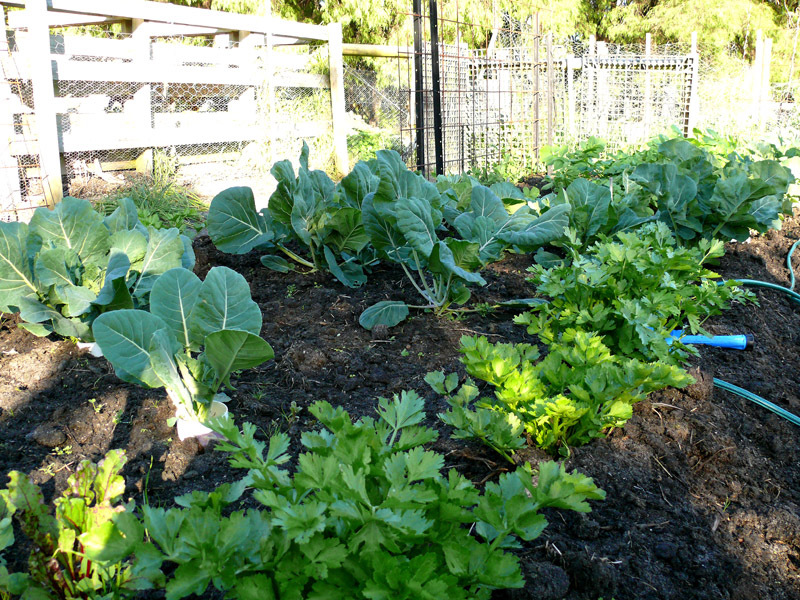 This bed has garlic around the edge, with English spinach and broccoli in the middle, with Swiss chard at the end. 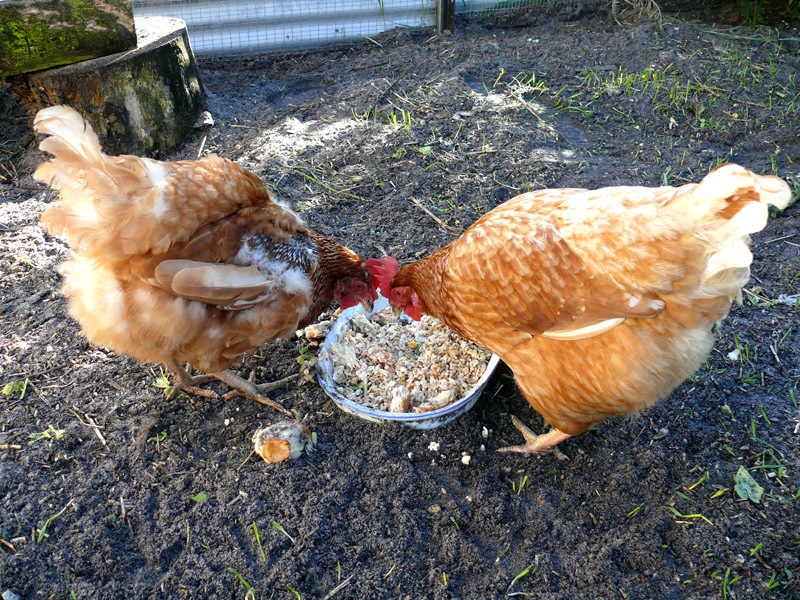 The chooks love eating the spare leaves from winter veg, any leaves that are hanging down too near the ground I pull off and toss into their yard, they gobble them up. 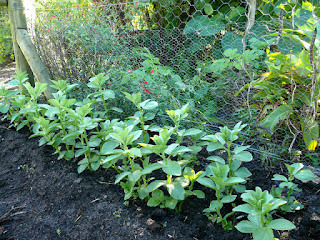 These are the broad beans. Steve has planted a lot less of these this year, they have been very prolific producers over the last 3 seasons and we end up with far too many, so less plants this year and more space for other things. There is also a bed of carrots in. 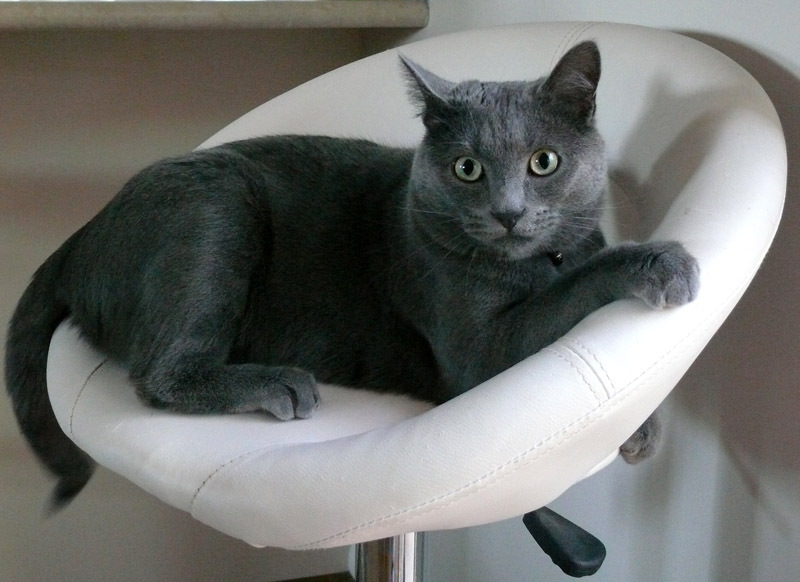 There are problems areas here and there. This is the one we are about to remedy. These are our hazelnut bushes, three of. 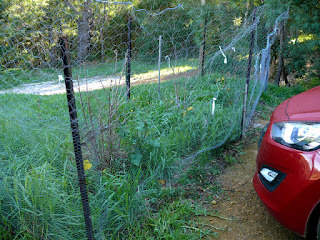 We imagined they would look lovely alongside the house as a nice thick hedge in front of where we park our cars. 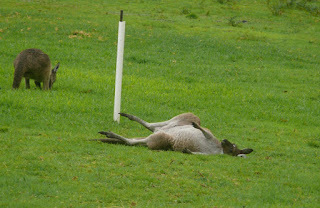 But we didn't count on how delicious the leaves are to the kangaroos, so much so that they broke down the small fence we'd put up to protect the plants. So we had to build a Fort Knox to keep them from being devoured, but with that comes the great difficulty of controlling weeds and kikuyu grass, so it's a sorry looking, unkempt area with sad hazelnuts. We are going to move them, we've found a spot in the back garden which has a boundary fence, so hopefully they will be happier there. 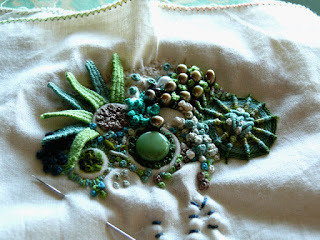 I've done stuff all craft this year, just not in the mood, but I am playing with a small embroidery that I started at our annual Stitches By The Sea workshop. We had to put small rocks, shells, beads, rings etc between two layers of calico, then let our imaginations run wild to create what is called Encrusted Calico. My shapes of trapped things have become somewhat obscured by lots of stitching, but it's been rather fun.